Planning to launch a startup? "I’ve got this idea, I have to give it a try!" "But, wondering where do I start? You’ve got an amazing idea and know that it can be the next revolution (think Uber, AirBnB), you are just halfway there. You need to know how to make it scale, understand how to cash on digital assets. And you need someone to hold the lines at the technical front and get it done as soon as possible. After all, timing is crucial for every startup, especially in the initial stages. If the plan & execution are Calvin & Hobbes, kickstarting a startup can be simple. A right start makes it easier on you in the long run. So whether it’s about planning, researching or rushing into building a product, a wrong start might make it worse. We sit down with you and dig deeper into your ideas and help you develop a robust roadmap for your product. Every founder works with a product manager and team of designers to assist in developing & structuring a plan and delivering the final product. Within 30 days, you’ll have a Minimum Viable Product with a feasible product plan to pitch investors, find cofounders, or build hype even before you launch, all done in $10K. All these along with frameworks and support services ensure you take the market by storm. So... $10k, what comes with that? Ever wondered why most startups are unable to scale or ultimately fail? Well, it is all to do with the product, its planning and most importantly the initial research. It is your idea, your brainchild and you need all the info first hand to get it right. Who is the competitor? How would the market react after you launch? What is the next growth hack? So many questions and you can feel the analysis paralysis creep in. Take a deep breath and let’s dive in together with product research. A thoroughness at this stage ensures a great product for the world to explore. With so many moving parts in a startup, the product is either a stack of dominos waiting to collapse or one of the coolest product around the block. Looks like the opposite ends of the spectrum but the only difference is a mature development strategy. Development strategy is serious business for us, we throw around words like agile, iteration, robustness, scalability a lot. But you need not worry, you just have to sit tight for the next 30 days and let us do all the grunt work. Probably more time for the next big idea. We love those wireframe sketches - clean, simple and objective! Simplicity can sometimes be the best thing that can happen to a product, and nothing signifies it better than a wireframe. Design trends can come and go but wireframes are forever! Wireframes is the stage when user experience is just born. Because Designs have so much going on with colors, fonts, theme, pictures, videos, wireframes help you look at the structure and flow of your product objectively. Now you might be thinking when do I get to see all the good stuff? Across all these stages of product development, a clickable prototype helps you sync between the very idea and product. 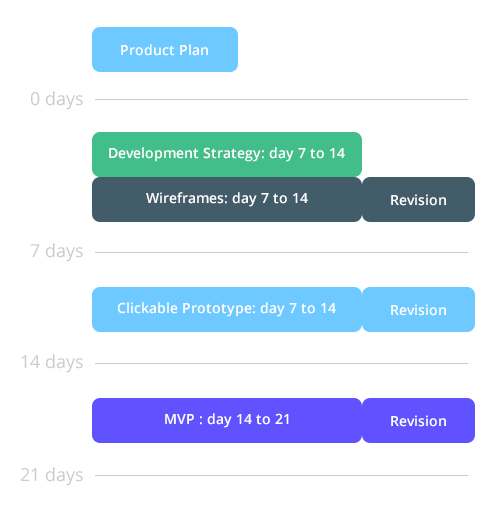 One way to align your final product with the roadmap is a clickable prototype. Now that you have the designs ready, a clickable prototype lets you click through the designs and get a feel of the product & the flow. On to the final step, let’s sprinkle some personality on your prototype..oops, we mean let’s add functionality to your prototype. Get your business cards ready. MVP will have all the essential features of your final product. And off you go to your first VC funding! Great ideas can be difficult to come by but getting to see it in action is satisfying. The MVP will help you reach out to your target market and get the validation on the opportunity you have been losing out till now. Now no more hand holding, you are ready! Get some love out there. How the heck can you pull this off in 30 days? Great Designers + Meticulous Product Managers + More than 50 startups under the belt + Bucket load of coffee! To get the ball rolling, you only need to invest $10k. This reserves your team of dedicated product manager and designers. You can schedule and pay the fee for the approved work. Hacking away to your product is a great idea, if you are looking to validate an idea. But would you like to go beyond the basic validation? We try to minimize these risks and hyper-focus your efforts towards building a great product. Ultimately, $10k is a drop in the ocean if we look at what is to come. To begin a project, we ask the interested founder to submit an application. This helps us to keep it small and add value to your startup. If it’s out of our realm, we do not touch it, unless you convince us otherwise. Once you apply, we’ll schedule a phone call after reviewing your application internally to ensure it’s a good fit. If we are all on the same page, we’ll invite you to participate in the project, sign contracts, and start our 30-days sprint! 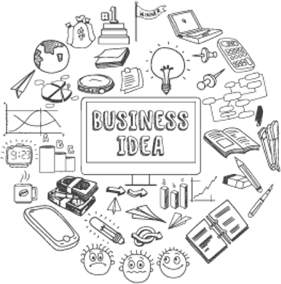 You will have access to all the assets along with the graphics and visuals from files and fonts to photos and post-able PNGs. 1999-2017. Website Design and Development Company Galaxy Weblinks Ltd. All Rights Reserved.